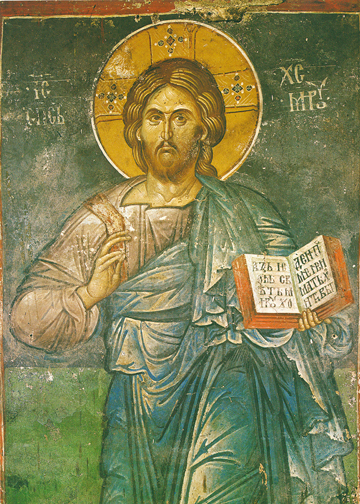 This icon of the Pantocrator (Greek for “Ruler of All”) is from the Patriarchate of Pec and was painted in the 15th century. To teach us from His life and words that were recorded as the Holy Gospels (for the Gospels are a literary icon that we also venerate in Church), Christ holds this treasure in His left arm and blesses us with the Sign of the Cross in His right. This is one of the two patterns that have come down to us from ancient icons. In the pattern seen here, three fingers are held together to represent the Holy Trinity, and two fingers are together and upright to show His Divine and Human Natures, with one slightly bent to represent the humility of becoming fully human at His Incarnation. In the other pattern, the Lord holds His fingers to show the Greek letters for “IC XC”, the abbreviation for Jesus Christ. We see in this icon by the position of the legs, torso, shoulders, and arms a strong sense of active movement in the Lord reaching out toward us, for we are to actively participate in His Life by becoming in the words of St. Peter “partakers of the Divine Nature.” (2 Peter 1:4) May we begin to draw near today!